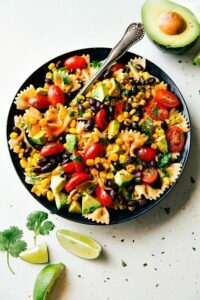 A delicious Mexican Street Corn Pasta salad with tons of veggies and a simple creamy chili-lime dressing. I have a pretty close schedule I stick with on what I share here on the blog. The months are planned by the days I’m sharing a recipe and what recipe I will be sharing on that particular day. But sometimes, I’ll switch up my entire schedule because I’m literally BURSTING at the seam to share something. Today is that day. 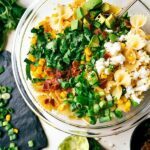 This Mexican Street Corn Pasta Salad is one of my all time favorite meals to hit the blog. Primarily because corn is my favorite veggie, Mexican Street Corn is my favorite way to enjoy said veggie, and adding pasta for a self-proclaimed carb-addict was the best.decision.ever. Also did I mention avocados, lime, cilantro, jalapeños, cheese, green onions, and BACON?! I’m pretty sure those are all my favorite ingredients together in one happy place. Annnnnd we haven’t even started on the dressing yet. The toddler has definitely inherited my taste-buds which is super lucky for me. When choosing where to go out to eat or planning meals for the week, we currently have 2 against 1 (the toddler + me against the husband). Because while the husband wants a triple-stacked cheeseburger with extra fries we are both asking for a salad + healthy sandwich combo at Zupas and it pretty much has the husband begging our baby to love burgers like him as soon as he gets some teeth in. One of the taste-buds our toddler inherited from me is a love for corn. He will literally pick a can of corn over a donut. I’ve also found someone that can out-eat me in popcorn AND he will beg for corn on the cob in the grocery store every single time we go. While he’s not the best at eating it off the cob, he will keep on trying until every ounce of corn has been removed. So to say he also loved this salad would be an understatement. Even the little bit of kick from the dressing + the jalapeños didn’t have him phased, but we’ve talked about his ability to handle spice, so this wasn’t too surprising. If you are worried about the spice, just leave out the jalapeños, paprika, and half the hot sauce in the dressing and it will be great! Speaking of the dressing, I adapted it from my latest favorite dipping sauce shared on the blog which has mayo, lime, and Sriracha. 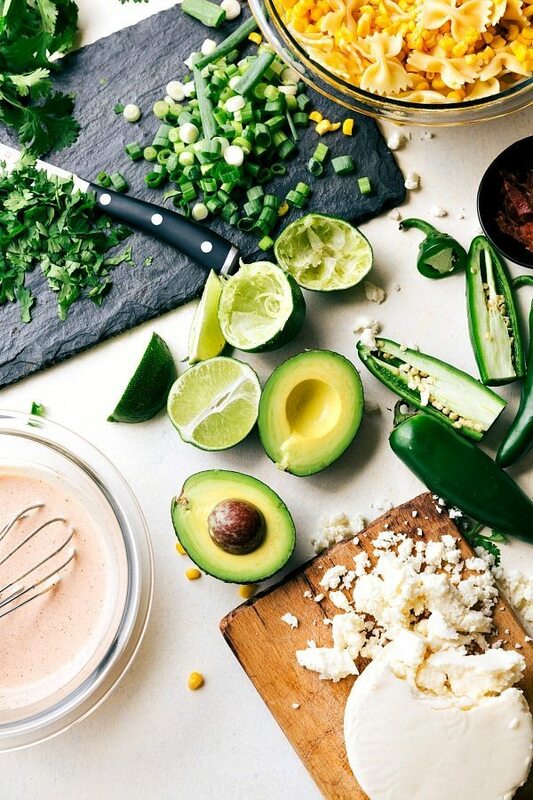 This chili-lime dressing has the same 3 ingredients plus a few spices and it is out-of-this-world delicious. Plus the best part is you just have to quickly whisk the few ingredients together and it’s ready to go. No blender needed! And now lets talk cheese for a second. 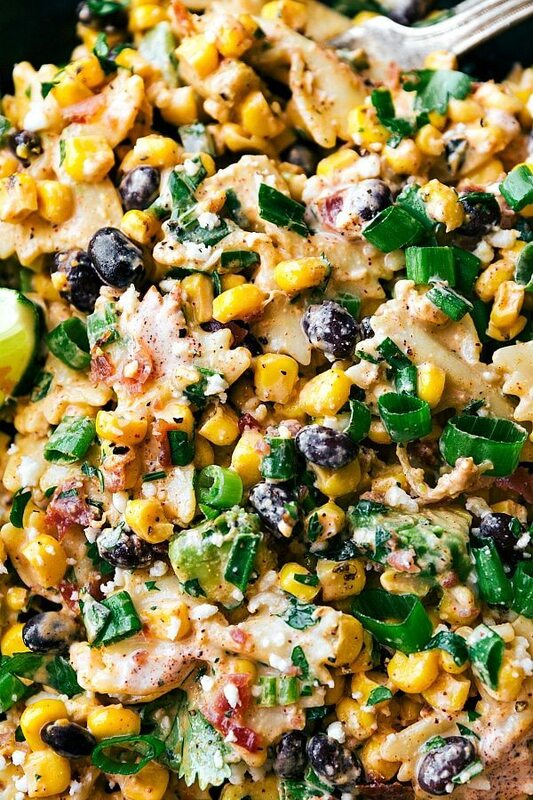 For super authentic Mexican Street Corn you are going to want to use Cotija cheese. It’s typically near speciality cheeses in the grocery store. 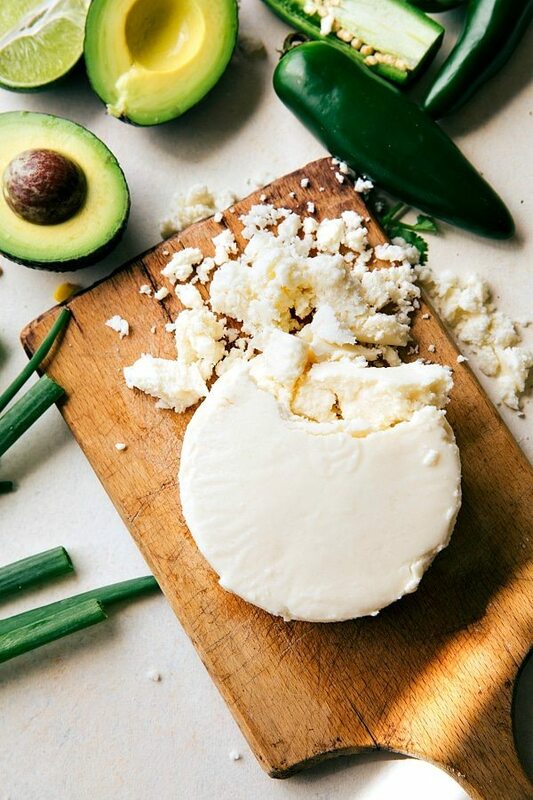 An easy alternative is Queso Fresco cheese which is generally near mozzarella and refrigerated tortillas in the grocery store. A last resort that will still work fine is feta cheese. Finally: the CORN which is the star of the show here. There are a couple of options for the corn in this salad. One is going to authentic route and grilling the corn until lightly charred all over. 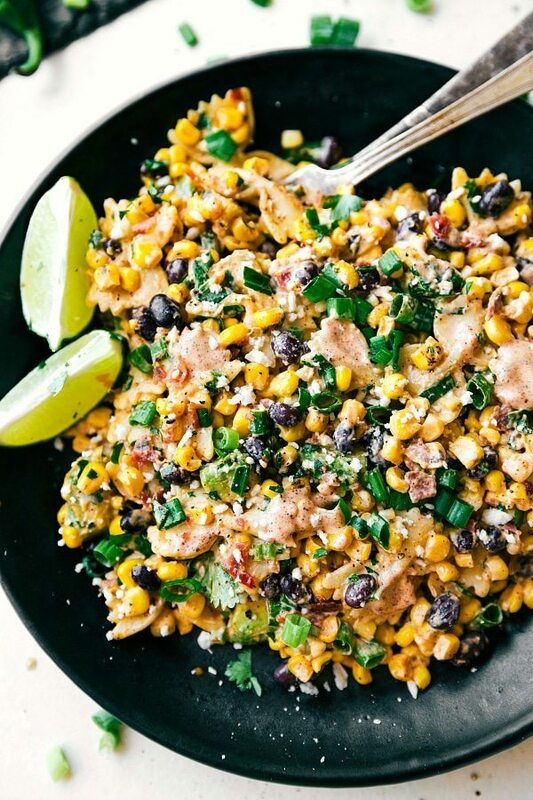 If you have a grill and the extra time, I would highly recommend going this route — it is incredible what freshly grilled corn does for this salad. The other options are easier and less time consuming which I know a lot of you are a fan of (including me 99% of the time!). Option #1: buy pre-roasted canned corn (near regular canned corn in the grocery store) and use 2 cans of that drained. Option #2: buy just regular canned corn and roast it for a few minutes on the stovetop. Whatever you chose to do, it’s corn at the end of the day, so it’s going to be AWESOME. You'll know the corn is done when the kernels are tender and easily pierced with a fork. 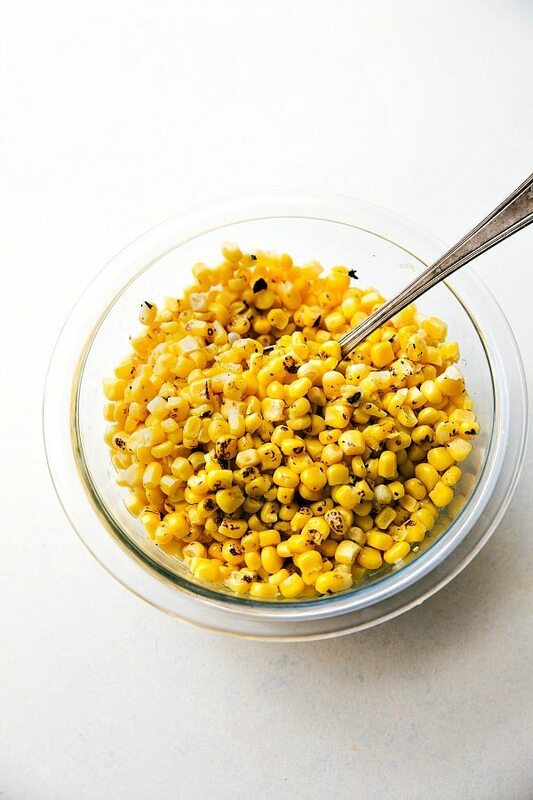 Alternative #1: use pre-roasted canned corn -- drain and allow to dry. Alternative #2: use regular canned corn: heat a large cast iron skillet on medium high heat for 3-4 minutes or until very hot. Drain corn and place in a single layer and cook for about 5 minutes stirring once in between or until browned. Avoid stirring too often as this will keep the corn from getting a good roast. In a small bowl combine all of the dressing ingredients and whisk together until completely combined. Toss with the salad and enjoy! 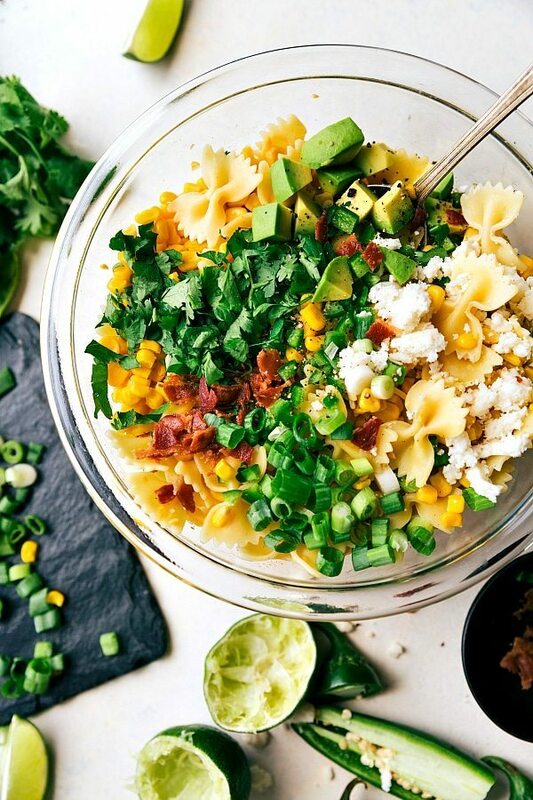 The focus of this pasta salad is more on the corn that the pasta. If you want a more "pasty-y" salad, increase by 1 cup dry noodles. You will also probably want to do more dressing. This looks so amazing, just printed to make it! Awesome! 🙂 Thanks Margo! I hope you love it! 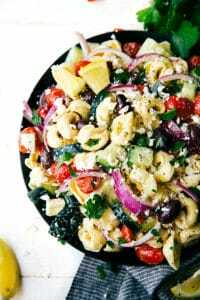 Oh my gosh, pasta salads are a favorite of mine (another carboholic over here) and this one has me weak in the knees! As usually your pasta salads are AMAZING, my friend! Looks delish! I could be mistaken but the picture looks like it shows black beans but the recipe doesn’t call for black beans? Are there black beans in here? Thank you Kari! Nope you are right 🙂 They are listed in the recipe under optional: 1/2 cup black beans. They are an optional addition if you’d like more protein. I made this today with the last of the sweet corn that I had left from a friend in Iowa. I charred the corn in an iron skillet, but after the fact. I wondered if cooking it in the bacon fat would have been awesome. The salad is fantastic and I love that it has a bit of heat. I will make this again. Ooo I bet that would have been super delicious! 🙂 Next time right? 🙂 So glad this was enjoyed, thanks for the comment Kristi! I made this today and came out delicious!! So glad to hear that!! Thank you Lula! Outstanding! I took this to a concert in the park and everyone asked for the recipe. Thank you! I love Mexican street corn, and I make sure get one anytime I’m up in LA and see a vendor. This is my new favorite recipe. I was just about to start making this but realized it doesn’t say how much cheese to use. How much Cojita cheese should be used? Just add it to your preference after everything is mixed together 🙂 I add about 1/2 cup. I found this recipe on Pintrest and made it today. It was delicious!!! I’m so happy to hear you enjoyed this salad Santina! 🙂 Thanks for the comment! Can I make this corn salad the night before (a day in advance) and have it still be fresh tasting? Can’t wait to make this! Should it. E left out at room temp or refrigerated? I have a question, for the mayonnaise, have you tried the Mexican mayonnaise? It already has lime it, im wondering if that would cut a step out and make it easier? Loved this salad! Omitted pasta and only used about 2 T of mayo. It was OUTSTANDING. Yum! I had some ears of corn leftover from another recipe, so I searched through my “to try” recipes, and chose this one to use up the corn. This recipe did not disappoint. It was really delicious! I loved the combination of ingredients and flavors. I know it was supposed to be more of a corn salad, but I thought it was quite heavy on the pasta, IMO. I used 2 cups uncooked pasta (right? Not 2 cups cooked pasta? ), and I thought that made for a really pasta-y salad, actually. I thought the salad wasn’t “wet” enough. It could be perhaps that I misread the recipe about the black beans, and I put in a whole can, instead of half a cup? No biggie though, since I love beans! Anyway, I made a second batch of dressing and drizzled a little more over individual servings. This is definitely a keeper! So happy to hear you enjoyed this dish! Thank you so much for the comment Kristin 🙂 And yes, right about the pasta! If I am bringing this to a potluck, will it get soggy if I put the dressing on too early? Should I wait till right before to put the dressing on? I’d wait to put it on right before serving. Enjoy! I am looking to make this less carb heavy. I wonder could the pasta be replaced with Quinoa? It looks amazing. You could definitely try it 🙂 Thank you! I look forward to making this at our next gathering but I wanted to mention that Trader Joe’s has nicely charred roasted corn in their freezer section. I was thinking the same thing, Carol! It is delicious. Have you tried it yet in this recipe? I’m sure it has to be defrosted and drained dry. I made this for dinner tonight and it was awesome! I’m recommending it to everyone! Is there a store bought alternative to the sauce? Not that I’ve ever heard of! Since I’m not a huge fan of cilantro, i was thinking of cutting the amount required in half. Is the cilantro taste very prominent? Could I even get away with eliminating it? Or would it be a huge difference? Emily, you can definitely do away with the cilantro. It’d be a lot less prominent cut in half but if you don’t like it at all i’d just cut it out all together. Hope you enjoy! This is going to sound like a really dumb question but is this supposed to be eaten hot or cold?? Can this be made the day before and would frozen corn pan roasted work. I wouldn’t recommend making it the day before; it is best made right before enjoying! Yes that will work fine. Oh my god, today was finally the day where I made this salad and it just tasts so good? I made this dish this weekend and it was a big hit! I made the pasta and charred the (canned) corn the night before, stored in the same container. The rest I chopped and assembled the day of. Tasted great! I was so excited to come across this! I’m always looking for new recipes for my husband’s lunches! 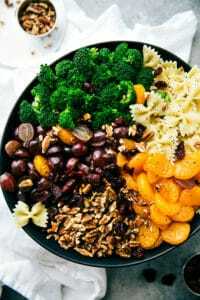 Now I usually make them in advance so I would love your advice- do you think I could mix up everything except cheese, pasta, avocado and dressing? And he could add those each day? Either that or possibly layering it like a mason jar salad and holding back on the avocado. Your thoughts? Love this recipe! I have only used canned corn but I think freshly grilled corn on the cob would make it 10x better! And she is not lying when she says to use full fat mayo. I tried it with low fat mayo once because this is all I had on hand… the sauce was clumpy even after mixing for a while. Still tasted fine but did not mix as well. Used Cholula for the hot sauce. We brought this to a potluck BBQ and it was a big hit. People were asking about it. It didn’t even need the avocado. I made this last night and threw in shredded rotisserie chicken breast. 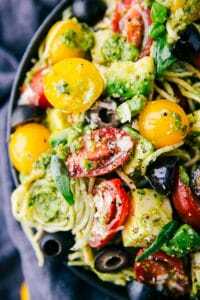 It made a terrific cool, light summer dinner! Oops! I forgot to rate this with my comment. Delicious! You show black beans in the video, but not on the ingredients list. Amount of black beans please? I plan to quadruple recipe for for 100 people! This will be epic! Thanks! ! Wow, thanks, it didn’t even show up when I printed the recipe, but there it is! My fiancé and I have made this recipe 3 times this past week because it’s just.so.good. We halved the recipe since it’s just the two of us and we cannot get enough! Thanks for a winning summer recipe! Looks amazing!! Can’t wait to try this recipe! Wow, this salad was incredible! I have been craving it since I ate it the other night. I did add grilled chicken to accommodate my large family. Thank you so much for sharing the recipe. It was perfect! What a compliment!! Thank you so much for the comment Annemarie ? Chelsea, this is an awesome recipe! I don’t care for avocados so as per your advice to someone else I just omitted them. It was easy to BBQ the corn, and getting it together in advance was a breeze, your instructions were very clear. We are a family of serious foodies and there were fights for the leftovers ( I doubled the recipe). Thanks! If I could give you more stars I would!!! Is it just as good without the bacon? I want to make this for vegetarian friends. They do eat cheese but zero meat. How can I char corn without a grill? I’d prefer to use corn on the cob and then cut it off (a friend made this for a summer potluck, and I practically ate the whole bowl by myself ??). You can cut it off the cob and put it in a skillet (dry; don’t add anything else) and let it char in the skillet over medium-high heat. Toss the corn occasionally, but not too often so you do get a nice char 🙂 Enjoy! I made this for a tailgate party at Angel Stadium and everyone totally dug it! I added tomatoes and roasted the jalapenos…YUM! Thanks! This was fantastic! My new favorite salad! Made this today, (first time making a salad dressing too) and it is sooo delicious. Thank you for an amazing recipe! You’re welcome! 🙂 So happy it was a hit! I made this just as written and I want the whole thing for myself. The guests will have plenty of other stuff, but this bowl of delicious is MINE!!! Seriously, this is a huge hit and going in to the regular rotation. Thank you !! Haha! I like the way you think 🙂 So glad this was a hit!! This is truly and amazing recipe!! I tweaked it a little, making the salad with Orzo, and adding red onion too..! Bomb. I loved the salad plain, just as much as I love it with the dressing. So when I served it I left the salad plain, placed the dressing on the side, along with some Tajin on the table. So many options, some people ate it plain with tajin, some with dressing, some with dressing and tajin. Served with chips too…! Probably my new favorite orzo salad! Thanks SO much. You can definitely give it a try 🙂 I haven’t tried it myself so I can’t say for sure how it will work. This is amazing! Added three cloves of finely chopped garlic to the dressing and used about 1/4 bunch of cilantro. Omitted cumin. My husband said this is the best recipe I’ve ever made! Thank you for sharing! Ahh i’m so glad to hear! :) Thanks Shannon! That will make a pretty different dressing and I think it will need some tweaking (or it end up a bit too thick/bland). Let me know if you give it a try! Great recipe, but the cook time was way off! Between the bacon, cooking the pasta, and roasting the corn I easily spent close to an hour prepping this dish. LOVE this! I made it for a sports banquet. I added a little more jalapenos and a little more siracha. I have people texting me for the recipe months later! Ahh this makes me so happy! And I love the extra spice with it! So glad you enjoyed! This looks amazing! I am excited to try it. How long does it last in the fridge if I won’t eat all of it right away? Also are there things that I should leave out of the sauce and only add right before eating? I hope you love it! 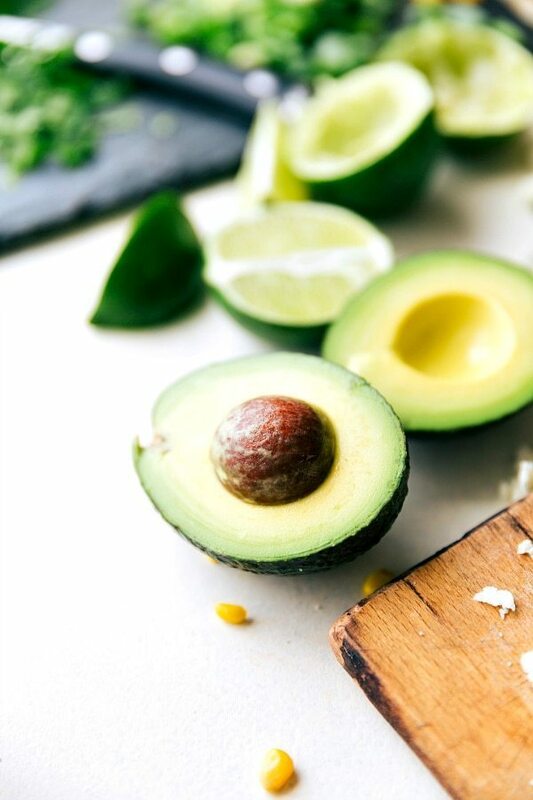 🙂 If you don’t plan on eating this in one sitting and immediately after making, don’t add the bacon, cheese, or avocado. Add those in separately right before enjoying 🙂 I’d also add the dressing to just what you are eating. Absolutely wonderful!!! I made this last to complement smoked chicken and there were no leftovers! Followed recipe to the letter and couldn’t be easier! Thank you Chelsea for sharing you now have one more messyapron follower. Keep the delishousness flowing!!! This was DELICIOUS! Such a wonderful combination of flavors. It all balanced out very well for a wonderful dish. My husband and I loved it!! The only downside is that it took me an hour to prep everything. The whole time I was thinking this better be worth all this work. But it WAS! 🙂 So so yummy. I will definitely make it again. I know you made a point of saying no subs for the mayo but what about Mexican sour cream? I swear it is sour cream and mayo mixed together. (I also realize this post was 2 years ago so maybe you aren’t still monitoring.) Either way I am making it for a potluck on Thursday with quinoa (our boss has celiacs so I try to provide something for everyone including her and those just trying to be gluten free). It looks delicious I am very excited to try it! I love this recipe so much Chelsea! It always gets rave reviews. Awesome for entertaining … makes a pretty presentation. It’s fresh, tangy, and has a tasty paring of flavors. I made this recipe for a church function on Sunday evening and it was a huge hit. Our Women’s ministry is going to feed each of our school campuses this year (one a month) and this is our main course. I had numerous requests for the recipe. AWESOME! Blessings! This is sooooo good. I made if for a bbq about a month ago and my family just loved it. The sauce is excellent and I’ve used on breakfast burritos as well. Thanks for the recipe. I’m making it again tonight for dinner!! Trader Joe’s has frozen grilled corn, I will try making it with it, looks amazing!